Skip the siesta for this Mexican favourite inspired by the colourful city of Tijuana. 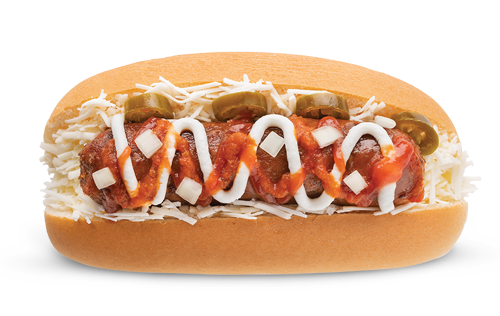 Our veg sausage gets a flavour kick with jalapenos, cheese, onion and spicy tomato sauce before sour cream calms your taste buds. Olay! 100% Vegan. 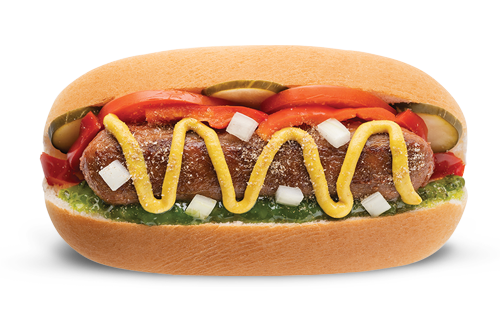 VEG SAUSAGE > Vegetable proteins (23 %) [Soya · Wheat (Gluten)] · Vegetable oil (Coconut kernel) · Wheat flour (Gluten) · Potato starch · Modified starch · Flavourings · Sea salt · Mustard · Celery · Hickory smoke flavour (0,4%) · Colour: Red iron oxide. VEGAN CHEESE (shredded) > Water, Coconut oil, Tofu, Soya Protein, Potato Starch, Thickeners: Carrageenan, Xanthan gum, Locust Bean Gum; Salt, Natural Flavouring, Dried Yeast, Calcium Phosphate, Sugar, Yeast Extract. 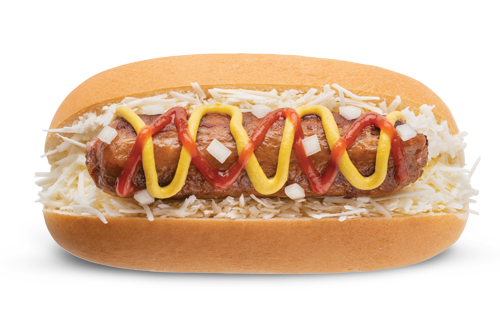 Other Hot dogs you will love!